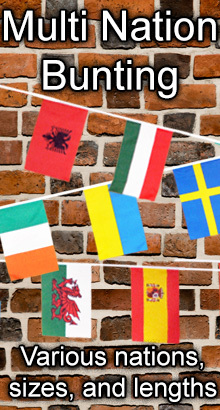 These flags are screen printed onto 100% woven polyester in bold, clear colours. They have a double stiched hem all around and a reinforced hem on the hanging side. 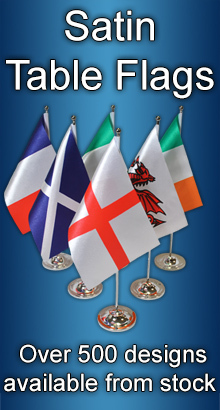 Our flags come complete with two metal eyelets for hanging, or a thick sleeved edge for flagpoles. All of our flags are packaged in individual polybags, this makes them ideal for mail orders. We can also offer retail packaging, please contact us to discuss this.